In 1947, Grace Murray Hopper was working on the Harvard University Mark II Aiken Relay Calculator (a primitive computer). On the 9th of September, 1947, when the machine was experiencing problems, an investigation showed that there was a moth trapped between the points of Relay #70, in Panel F.
The operators removed the moth and affixed it to the log. (See the picture above.) 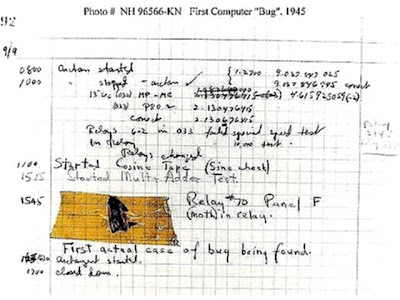 The entry reads: "First actual case of bug being found." Although Grace Hopper was always careful to admit that she was not there when it actually happened, it was one of her favorite stories. uu nga noh bug nga! now i know tnx sr.
ou nga,, ngaun q lang nakita yan! ahahahahaha sir may spray ba para jan! 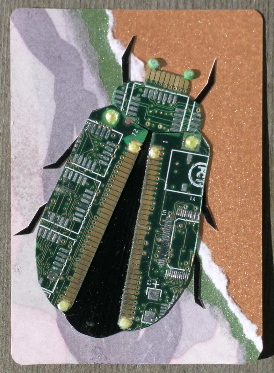 Eng ahah di naman ganyan itsura.. aha dun lang na coin yung term ng COmputer Bug ahaha..
di mo alam ang computer bug? ?